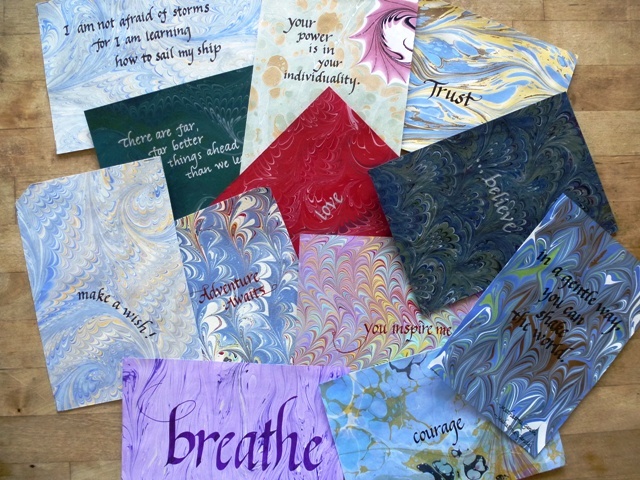 Marbled papers + Calligraphy and Script = Gorgeous!! Just a really quick post (with down and dirty photos!) about a project I'm working on with the talented artist, Amy Siu. She and I are coming together to bring words of inspiration, hope, passion, and joy as well as thought-provoking quotes on cards and matted art. As you can see, her script is STUNNING! I can barely take my eyes off these papers. And I love how in many pieces she wrote with the "flow" of the marbled energy on the paper. This is just our first round of goodness and now that I have in my hands our collaboration efforts and see how she works on my paper, I am so inspired to hit the studio and make some pieces just for her. Better photos and more info on this beautiful collaboration coming soon! !